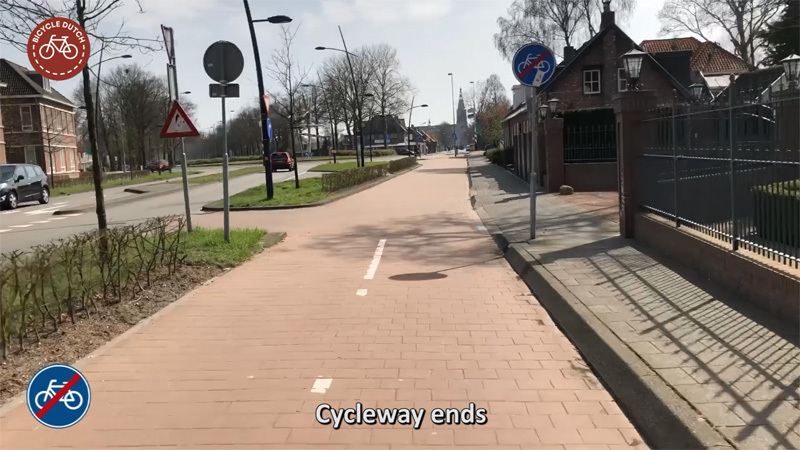 Recently, I had to cycle all the way through the town of Boxtel, from north to south, on my way to film the fast cycle route between Oirschot and Boxtel. 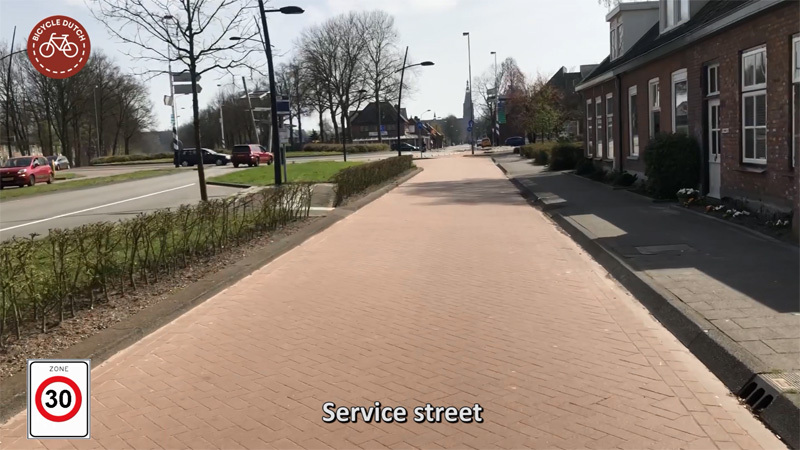 I choose a different route in Boxtel, the fastest and most direct route, bypassing the route to the station that you can see in that other video. 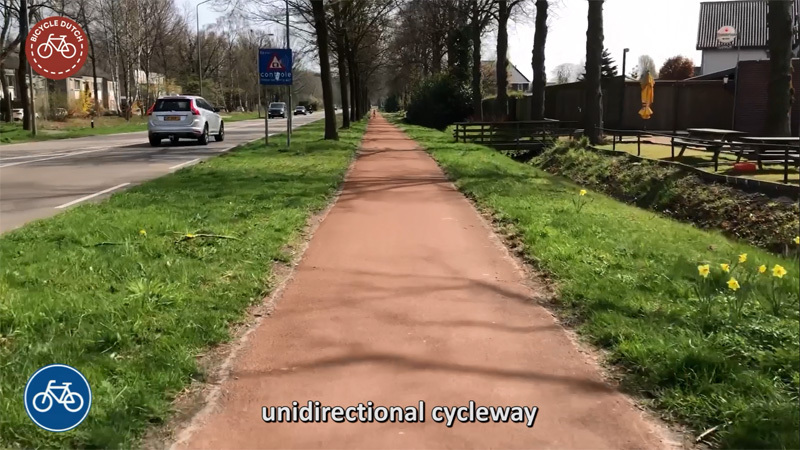 Since I knew I would find quite a number of different types of infrastructure, in a relatively short ride, I decided to film this ride as well. A video of my ride through Boxtel. Boxtel is by no means a special town. It is a typical town with quite standard cycling infrastructure, which is in fact a bit older. The route I took used to be the main north-south route in the country, until the motorway bypass around Boxtel was built in the 1970s. 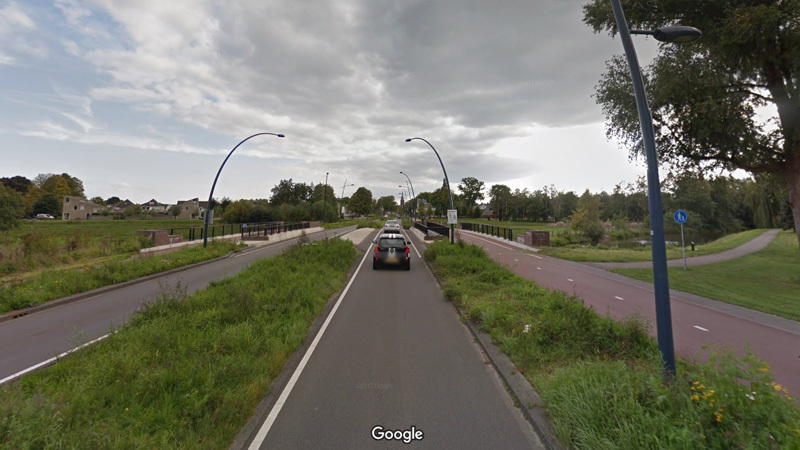 I can remember driving here with my parents in the early 1970s from Utrecht to my great-grandmother (my mother’s mother’s mother) who lived in Helmond, more south-east in the province of Brabant. You can still tell this used to be a main motor traffic route, but all the streets have been converted to 50km/h streets with mostly separate cycling infrastructure, sometimes on a service street. 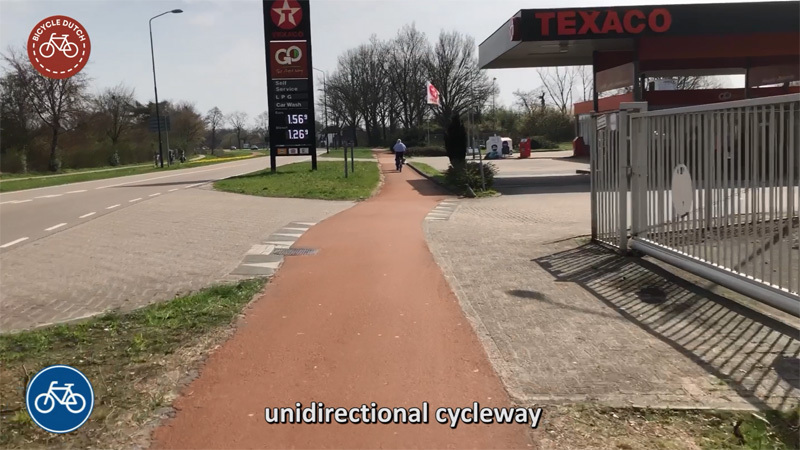 Between 2010 and 2015 one part has been reconstructed from on-street cycle lanes to a modern bidirectional cycleway on one side of the road and a more traditional unidirectional cycleway on the other side. There are also four roundabouts in this ride. One already existed when this was a main motor traffic route. That is the one that is not built according to modern standards. Caused by the simple fact that it was there before those standards existed. 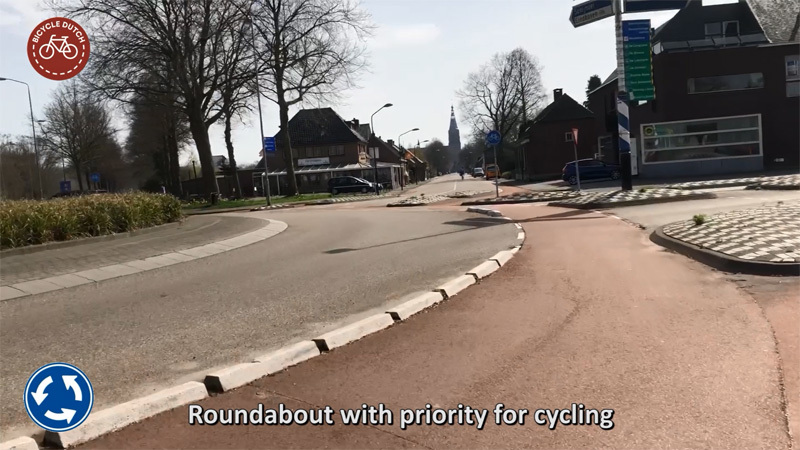 All four roundabouts are in the built-up area and fortunately Boxtel chose to give cycling priority as the guidelines dictate. 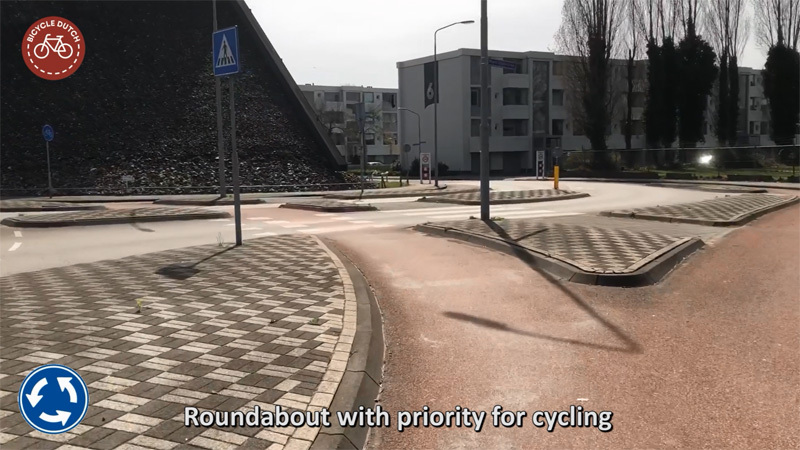 Last April roundabouts were in the Dutch news. A commercial channel had published preliminary results of an investigation into the safety of roundabouts without the consent of the investigators and against agreements that were made. “We are very disappointed about the unauthorised use of the results by RTL news” said the director of traffic investigation bureau VIA. What was even more poignant: the investigation was done to correct earlier mis-information by the same news channel, when a reporter had misinterpreted figures in earlier investigations. What it comes down to is that due to the very low number of incidents, underreporting of incidents and not knowing the exact locations and circumstances of incidents it is near impossible to draw scientifically sound conclusions about the detailed safety of roundabouts. What is clear is that roundabouts are 75% safer than ordinary intersections. 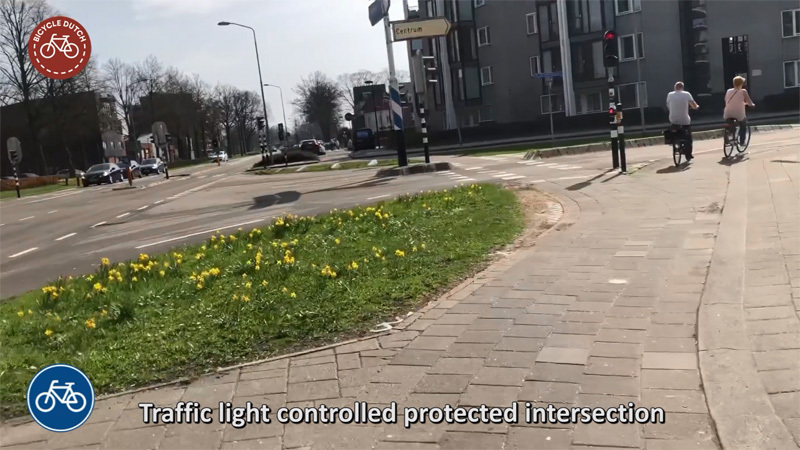 What is also clear is that there are more incidents on roundabouts that are not built following current Dutch guidelines. Namely, that roundabouts in the built-up area need a circular cycleway outside the roundabout and that cycling should have priority. “Of the 253 roundabouts on which most incidents were reported, 65% were not built according to these guidelines”, wrote TV-channel Max. 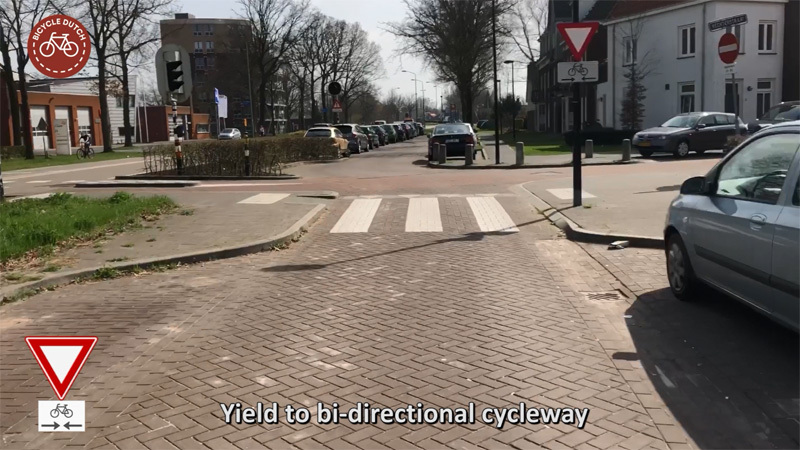 Some cities and provinces keep refusing to follow the now 20-year-old guidelines, notably the city of Tilburg and the province of Drenthe (with Assen as its capital). The new minister for transport Cora van Nieuwenhuizen said in a reaction that she will soon put traffic safety firmly on the agenda. In the same Max article she called on road managers to follow the guidelines, as did her predecessors. Wim Bot of the Cyclists’ Union said: “municipalities and provinces should better motivate why they would like to construct a roundabout that does not follow the design principles.” The Cyclists’ Union would like the minister to oversee this better and if necessary laws should be passed if that still doesn’t help. Boxtel in 1940/1960/1980. The original road through town was moved west twice. I cycled the 1960 route from north to south. The motorway, much further to the west, was constructed in the late 1970s. Historic maps from Topotijdreis. My route from the north end of town to the south end starts and ends with on-street cycle lanes on a 50km/h road. These streets should not exist that way, according to current guidelines. Such streets must have protected cycleways. Fortunately, closer to the town’s centre, where more people cycle, that is indeed the case. Below some pictures of the route with an explanation in the captions. You enter the town of Boxtel from ʼs-Hertogenbosch on the Bosscheweg (which means Road to ʼs-Hertogenbosch) on old-fashioned on-street cycle lanes on a 50km/h street. This type of infrastructure is not recommended in the current design manuals. 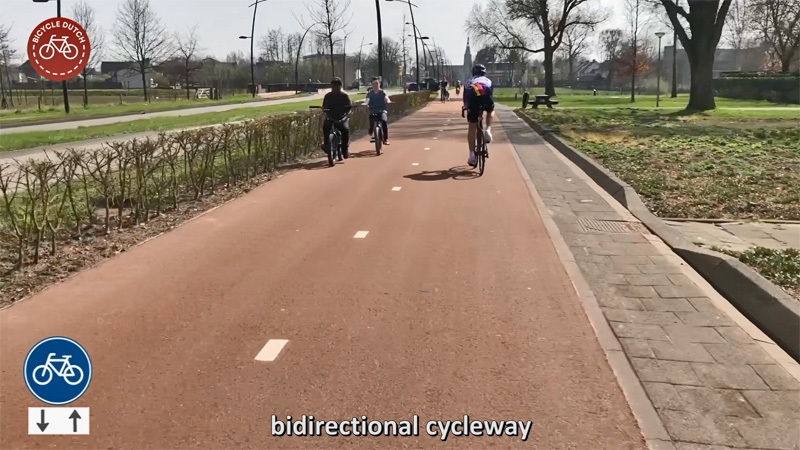 Quite quickly that road changes into a road with protected unidirectional cycleways on either side of the road. This is according to current design standards. The first roundabout is nicely built according to the latest design recommendations. 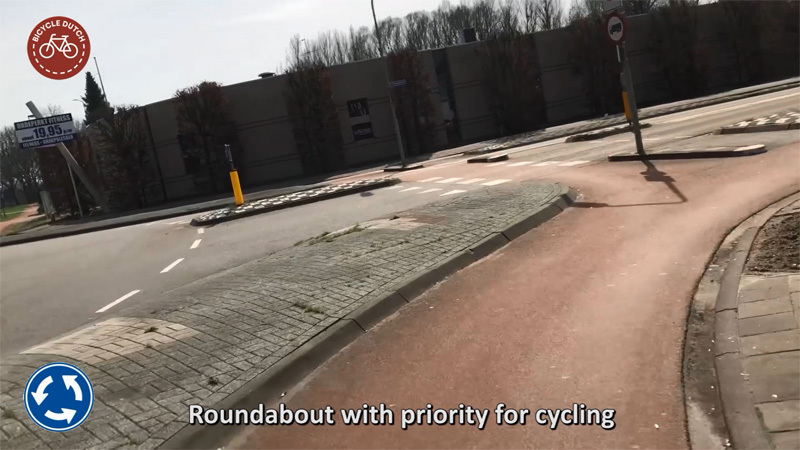 Note that while cycling has priority on the roundabout. you need to give priority to people already cycling on it when you enter the roundabout. The sharks’ teeth make that clear. The cycleway around the first roundabout is perfectly circular and at least 5 metres from the circle for motor traffic. A text-book example of a Dutch roundabout. This part of the route has the most modern infrastructure. It was built somewhere between 2010 and 2015, comparing Google StreetView images (see earlier in this post). 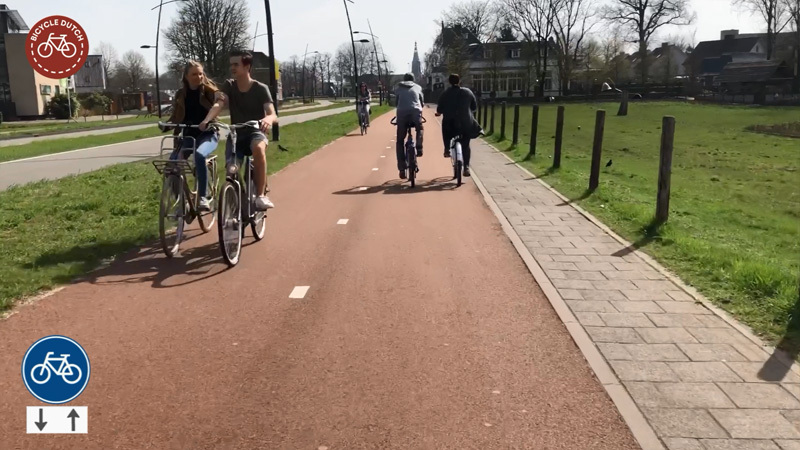 This cycleway is wide enough for two people riding side by side to ride past two people riding side by side coming from the opposite direction. Note how closely together the Dutch can ride. The handlebars are almost touching. The young couple to the left is actually riding arm in arm. In earlier videos people asked what the red band on this sign meant. It means “end of the cycleway”. It doesn’t mean you have to merge with motor traffic from here, the route simply continues on a service street. This very low volume service street has a speed limit of 30km/h and the only people driving here will be those who have a business in this very street. Since there are only a handful of houses here, that will not be very many people. This older roundabout predates current design specifications. That this older design can still work in the Netherlands doesn’t mean it should be copied. It is very unlikely new roundabouts will be built like this. The old road through Boxtel went straight-on in the direction of the church tower. The first bypass around the village was built to the left around 1960 and the rest of the filmed route is on that bypass. In the late 1970s a motorway replaced this first bypass. That motorway is located even further to the left. 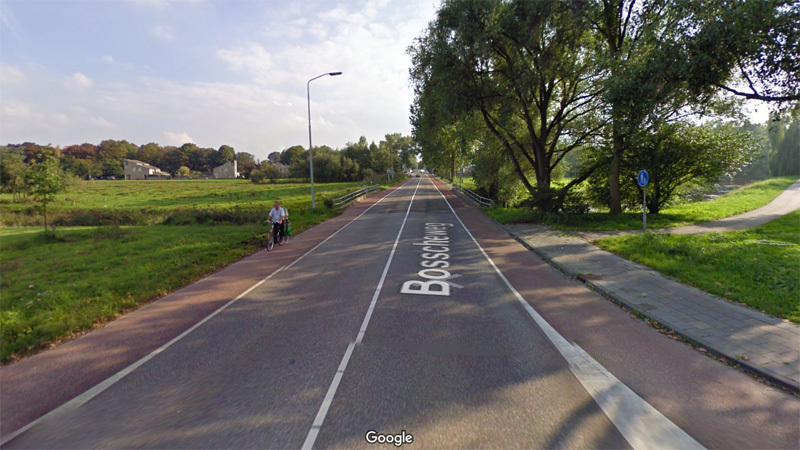 The design of this street (Brederodeweg) clearly tells us that it was designed as a main route for motor traffic. This was the first bypass of Boxtel. The cycleway was always part of this design. The original cycleway surface was replaced by red asphalt. I estimate that to have happened in the 1990s. This asphalt is not as smooth as you would like it to be. 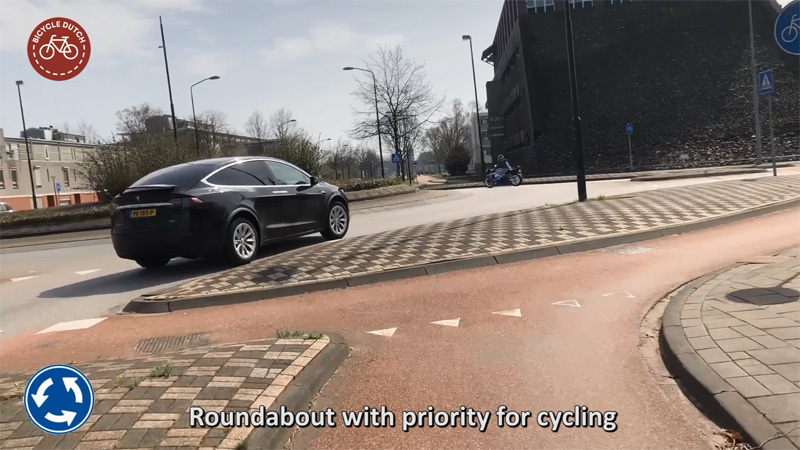 The third roundabout is again a textbook example of a safe Dutch roundabout with priority for cycling. This protected intersection is the only signalised intersection in this route. The tiled surface is clearly old. Because this was filmed looking into the sun, the shadows reveal how uneven the surface is. It is no wonder that this type of surface is becoming increasingly rare. Another short service street. In this case it crosses a cycleway with priority (on the left). The side street on the right is a cycle street. Note the extra warning that you must yield to people cycling from both directions. The yield sign alone would be enough, the sub sign is just an extra reminder. 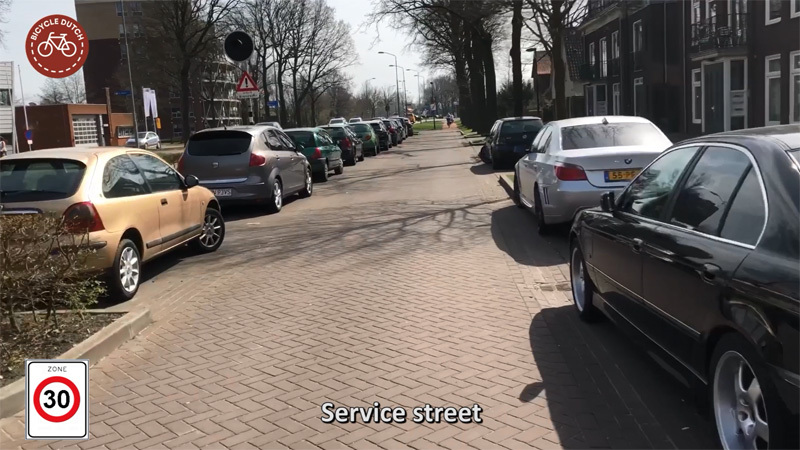 This service street has parking on both sides for a short stretch. You can see that I cycle more to the centre of the street to avoid dooring. Even though dooring is very unlikely. The fourth roundabout is a bit odd. The cycleways are not perfectly circular. This seems to be a roundabout that has been converted from a roundabout outside the built-up area (where angled cycleways are the norm) to one inside the built-up area. It is this sort of roundabout (not completely according to standards) that is most confusing to people. Such roundabouts should really be re-constructed. The cycleway crossed many private driveways that do not have priority. Drivers of vehicles using this commercial access to the fuel station must also yield to people cycling. The continued red asphalt and the sharks’ teeth make that extra clear. 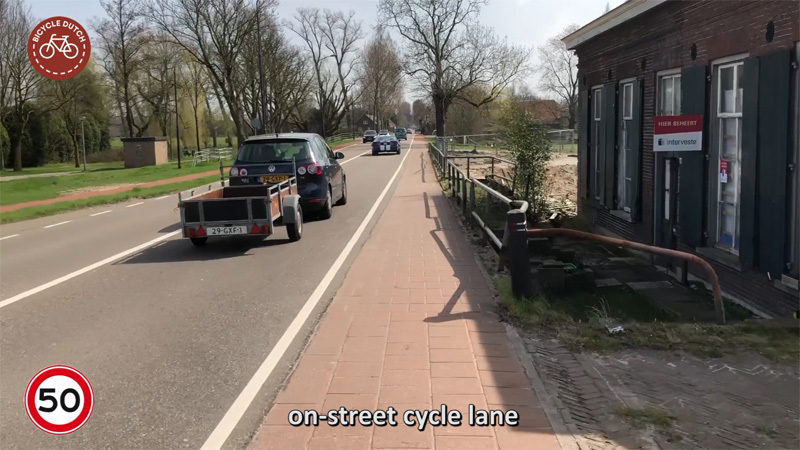 When we leave the built-up area of Boxtel in the south, on Eindhovenseweg (meaning Road to Eindhoven), there are old-fashioned on-street cycle lanes again. Fortunately this is not a long road like this. Very soon this connects to the fast cycle route to Oirschot that I showed in an earlier post. This route might change in a few years. 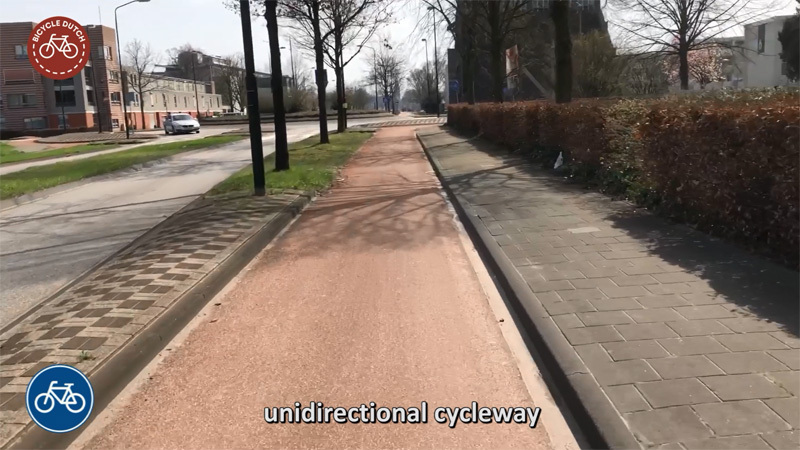 It’s part of what I think would be the most logical route for the Den Bosch – Eindhoven cycle highway that is being planned. That even a provincial town as Boxtel has such fine infrastructure for cycling is making me a little bit jealous. 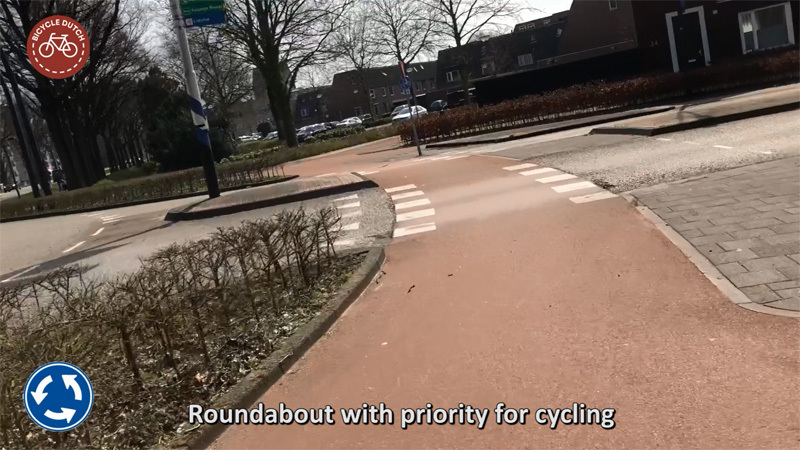 Appingedam and Delfzijl have several roundabouts but none of them have priority for cyclists. Best part of the video: the dinosaur in the center of the roundabout at Schijndelseweg! At first, I thought it was a Triceratops, but it is actually a similar dinosaur, a Styracosaurus. It was placed there as a promotion by the Oertijdmuseum of Boxtel. 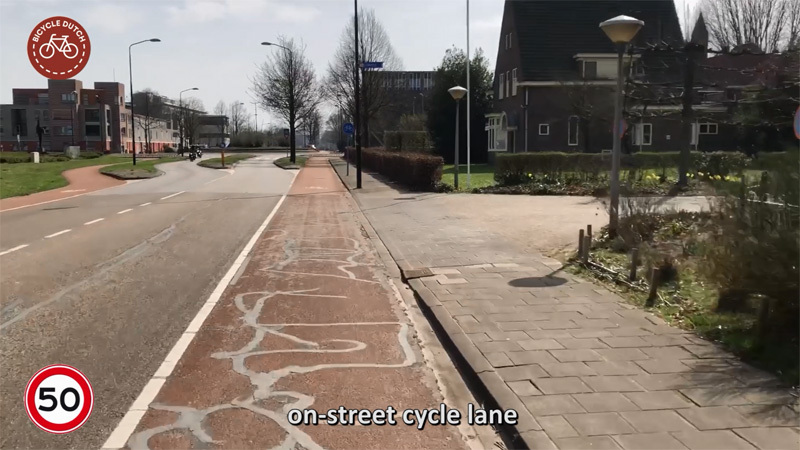 The picture of the 50 km/hour on-street cycle lane looks very familiar to most bicycle riders in America, except our traffic usually 80 km/hour, while looking at their mobile phone, and moving into the bicycle lane to make a right turn! 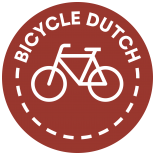 This entry was posted on 8 May 2018 by Bicycle Dutch in Original posts and tagged Boxtel, cycle lanes, cycle paths, ride, roundabout, service street.